I was looking for a picture in my files this weekend and came across this picture. I totally forgot I even took it and can’t believe I didn’t rush to share it straight away, because I rather like this shot. It’s a nice view down 10th Street and it’s kind of cool with the train going by over top of the street. Views like this always make me love Calgary. 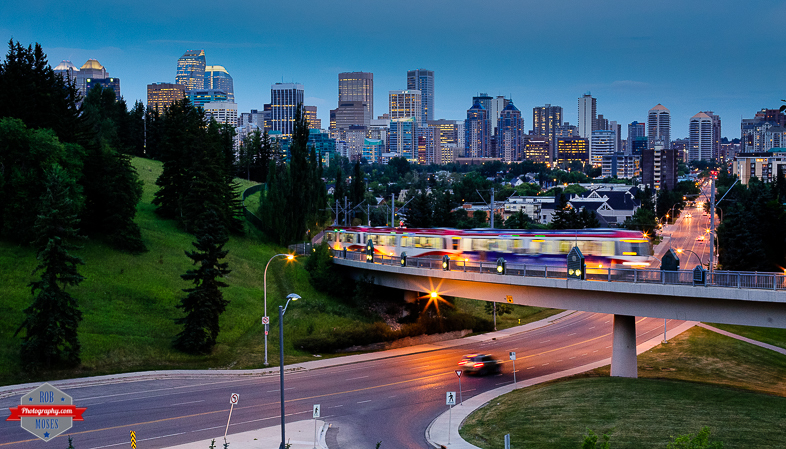 This entry was posted in Cities and tagged 10th, 50mm, 6D, Alberta, beautiful, building, buildings, C-train, Calgary, Canada, Canon, cars, city, City Life, condos, Kensington, LRT, metro, overpass, Park, photo, Photographer, Photography, pretty, prime, sky, Skyline, skyscrapers, street, subway, tower, train, Urban, yyc. Bookmark the permalink. It’s a nice shot. The amount of blurring on the train gives it a cool look, almost like it is painted. Thank you. I like the movement in the train too :). Your photos of Calgary make me want to visit! Thank you! You should visit Calgary! Just make sure you come in the Summer haha. I’ll give you a tour ;). Gorgeous shot, with wonderful leading lines and glorious colors. Calgary should name you its photographer laureate. Thank you very much! And that would be something wouldn’t it haha. Nice composition. Love the colors. I love it Rob. Calgary does look gorgeous in this photo! so how does it look this week with all the snow?! Beautiful photo and I really love that colorful train. beautiful, rob! love your sharing!